Pop Pop and Nana go gaga as Shyamalan adds another gem to his trove. Don’t cast teens as protagonists. Stay away from twists. Don’t try to weave in a message. And please, for the love of all things cinematic, do not use the found footage technique. Such is the advice a critic might bestow upon the director of a contemporary horror film. Despite ignoring each of these presumed precautions in The Visit, M. Night Shyamalan manages to prove his directorial ingenuity once again. The film offers equal parts humour and horror, topped off with Shyamalan’s ever-present moral message. And it’s all steeped in the scenario that this generation’s Hitchcock has mastered: strange things happen to engaging characters in remote and unglamorous locations. Fifteen-year-old Becca and her peppy younger (by two years) brother Tyler, self-dubbed T-Diamond Stylus, set out to spend a week on their grandparents’ Pennsylvanian farm. Becca, a budding director, wants to film a documentary that explores the longstanding rift between her mom and her grandparents. The story, unfolding through Becca’s cameras, quickly reveals that “Pop Pop” and “Nana” are a far cry from the cookies and cocoa grandparents that many of us envision . . . especially when the sun sets. Their behaviour grows more erratic and more eccentric. The tight-lipped Pop Pop, prone to bursts of violence, retreats to his shed and makes the most of his incontinence. Nana obsesses over the cleanliness of her oven and engages in a variety of nocturnal oddities. Employees of the local hospital stop by and express concern that the couple has stopped coming to volunteer as counsellors. By the film’s end, the viewer will get gobs of what Shyamalan does best, such as funny dialogue, the goosebump-inciting twist, and the evocation of contrasting emotions. For instance, sequences in which the siblings debate whether to investigate the strange sounds just outside their door merge humour and tension. The film’s climax, in which both protagonists confront their weaknesses, brings to mind the intensity of that in There Will Be Blood. Films with kids who act beyond their years can be supremely annoying (think Home Alone), yet in The Visit, as with other Shyamalan films, it somehow works. Teens Becca (Olivia DeJonge) and Tyler (Ed Oxenbould) stand as fully developed characters with an innocence and sense of wonder that contrasts with the typical horror film teen so quick to shed clothes and crack open beers. The siblings also represent Generation Z. These are the kids who’ve grown up with the instant access to unlimited information that today’s technology affords. They’re perceptive. They’re intuitive. They’re sensitive. While Becca is the voice of reason, Tyler is the primary source of humour. His vibrancy, curiosity, and even charisma more than make up for his misogynous (Becca’s word) impromptu rapping that grows a bit tedious. In one of the funniest scenes, Tyler’s bright green jacket rebels against the bleak winter setting as he imitates Nana’s antics. 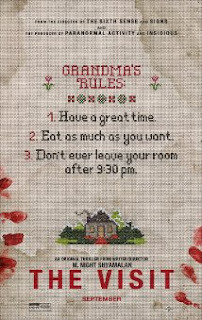 Though The Visit has many strengths, its true jewel is Nana, who bangs and scratches her way through the film. Chicagoan Deanna Dunagan achieves an unpredictability on par with Heath Ledger’s Joker: one never knows whether Nana will laugh hysterically or burst into tears and start hitting herself. This instability is especially effective during sit-down interviews when Becca attempts to coax from her grandmother details about the falling out with Becca’s mother. Critics have been unjustifiably harsh with Shyamalan’s films. Consequently, it’s quite possible that with this latest film about the making of a documentary, Shyamalan is, in a sense, revisiting those critical slings and arrows. 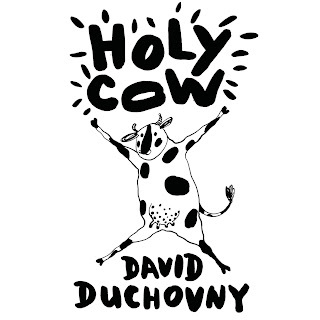 Holy Cow (Macmillan Audio; Audible edition) by David Duchovny. Subtitled a modern-day dairy tale, Holy Cow is the story of Elsie, a cow who discovers the grim fate awaiting her kind in the slaughterhouse. With Shalom the pig and Tom the turkey she makes a break for it. Animals can talk to each other through grunts, whistles, barks and squeals, “a kind of universal beastly Esperanto”, which will come in handy as they travel the world. Elsie hopes to reach India, where cows are revered. Shalom dreams of Israel, where no one eats pork, and he’s already using Yiddish words and phrases and planning his circumcision. Tom is heading for Turkey, but his real dream is to fly. It’s a short book, lasting just three hours, broken up into forty-eight chapters. 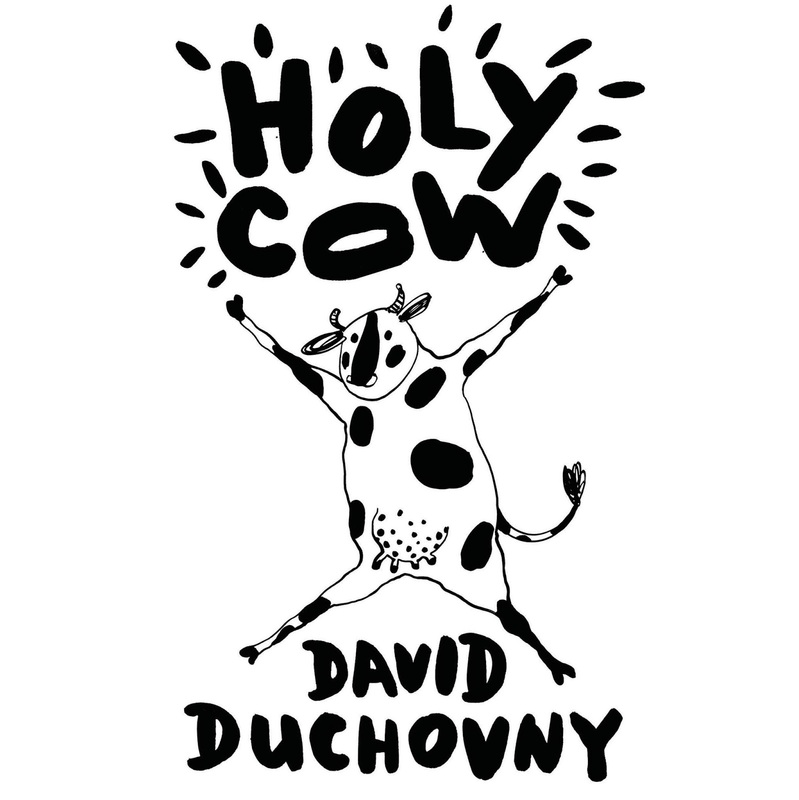 Duchovny reads the audiobook himself, and is much more laid-back than fans of Californication might have expected – it’s friendly and conversational, rather than intense and tortured. That’s not to say he isn’t talking about some big stuff: our treatment of animals, religion, strife in the Middle East. He makes some pretty good points, but the message never overwhelms the charm. I wasn’t a fan of the script-like dialogue style, especially early on – it may have looked economical on the printed page, but slows down the audiobook with its repetition – and yet, overall, this is much better than people might have expected. Just when is it safe to go back in the water? Returning to his home town, troubled young Afghan war veteran Nick Boxer (Michael Guy Allen) finds solace in the love of the inscrutable Kayla M (Meg Braden), a girl with whom he feels an immediate, palpable connection. When Kayla commits suicide, Nick tries to do the same by electrocuting himself, but in the seconds between dying and being revived finds himself re-experiencing moments of their relationship and picking up details he missed when he was alive. Convinced there is more to Kayla’s death than first appears, Nick, with the help of close friends Elliot (Julian Curi) and Ben (Zac Snyder), sets out to kill himself again, zapping his consciousness down memory lane as he tries first to understand, then to alter, the past. 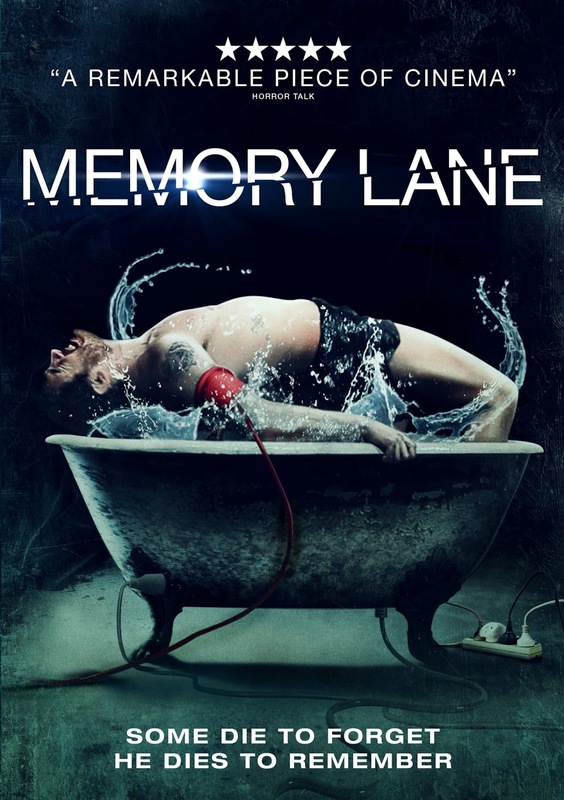 Memory Lane (dir. 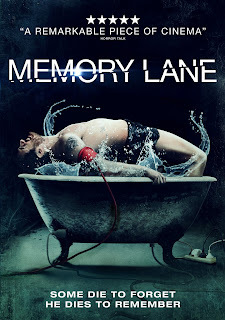 Shawn Holmes) has been likened to Christopher Nolan’s Memento, an apt comparison insofar as each employs a non-linear plot to explore themes of narrative veracity, grief, memory and perception. Both films were made on relatively low budgets, both are cleverly scripted and both display artfulness not for the cheap thrill of deception but rather for the sake of good story-telling. Yet, whereas Memento remains perfectly executed right to the end, Memory Lane stumbles at the final hurdle and so must forfeit its standing ovation and receive only with some caveats the garland of critical acclaim. The subtleties of the story are rendered with a deft touch – particularly the overlap between Nick’s mental state post-war and his retroactive acuity while dead – but the denouement feels rushed, and while everything makes sense (air quotes) the reveal does not inspire the audience to an epiphanic fathoming so much as a slow-nodding, piecing-it-all-together sort of reconcilement after the fact. Memory Lane in this respect bears some resemblance to Shane Carruth’s Primer, which made a beguilingly naturalistic foray into time travel paradoxes only to fall on the sword of expository narrative voiceover some fifteen minutes short of feature film length. Both movies evidence the best aspects of independent filmmaking: a clear focus on story over spectacle; relatively unknown actors bringing their (considerable) talents to bear unencumbered by preconceptions; dialogue as it would occur in life, not just words intended solely for the viewer and near enough flashed up as intertitles while the characters choke on schmaltz; in short, the cohesiveness that comes from having one person in charge from the outset, pursuing a distinct editorial vision. As it happens, both movies also fail to stick the landing, but so be it. Memory Lane is only sixty-eight minutes long (perhaps it was made with film festivals in mind) and for all that Holmes and co-writer Hari Sathappan concentrated on proofing their script against extraneous material, it’s hard not to think they were somewhat more attuned to their own knowledge of the story than how an outsider might perceive it. That doesn’t mean the end product is not well worth watching, or that up-and-coming auteurs like Holmes don’t deserve awards for kicking down the doors of an industry so corporately skewed it would rather spend $73 million making Battlefield Earth than give new writer-directors the time of day. It just means there’s even better to come. To praise any film relative to its funding or that of other productions must surely do it a disservice – Memory Lane requires no special consideration to secure its recommendation – but in this instance the figures demand mention, if only because they will seem hard to credit. Memento started life with a budget of $4.5 million. Primer was brought to the screen for only $7,000. Memory Lane cost about $300. It was made (in the sense of remuneration, not skills deployed) as an amateur production: a labour of love. Yet, the core idea and its realisation belie the lack of finances, and either the script was written with certain actors in mind or Holmes has the Midas touch in casting unknowns to fit each part. The cinematography is not always slick (Holmes took responsibility for everything himself), but if anything this rawness adds something to the characters’ emotional state and to the immediacy of what’s taking place; it certainly doesn’t detract, or prevent Holmes from sending us twenty-five years down memory lane, back to when we first saw Flatliners. Since its festival run (and before that, a limited pre-release online) Memory Lane has garnered quite some renown as the $300 film. More than that, though, it is an estimable movie in its own right, and the first step – taken without shoes, let alone a shoestring – of a filmmaker who promises to make great strides within the profession. So long as the critical approbation for his debut isn’t dependant in some way upon Holmes electrocuting himself in the future, we’ve much to look forward to. Calling all contributors! Issue 54! We are now closed to submissions for issue 53, but as one window closes another opens up, and we are now open to submissions for issue 54. "What’s going on with these three characters? Their fate lies in your hands! 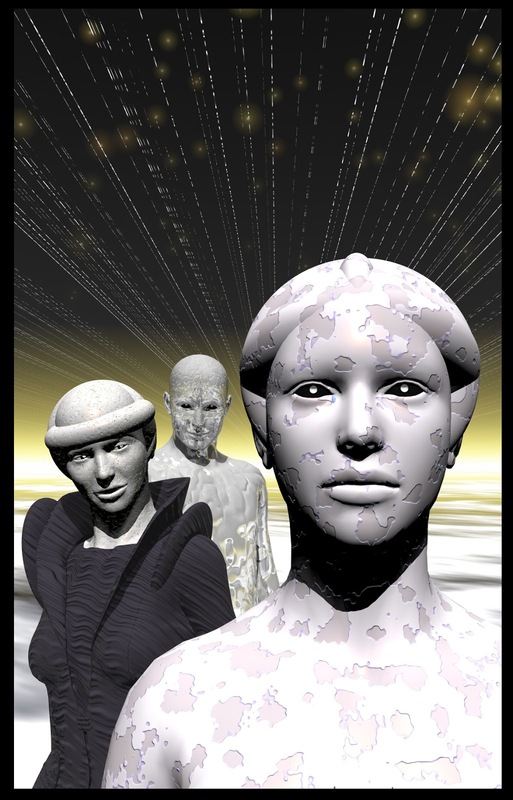 TQF is looking for short stories based on this image, to appear in issue 54, guest edited by me, Howard Watts. Normal TQF guidelines will apply, but I’m looking for strong character, conflict and ultimately plot – a completely developed idea, with a resolution." As a bonus, an online poll will then ask the readership to decide the most popular story addressing the theme, and the author of that story will receive a year’s subscription to TQF (or a cash equivalent if outside the UK), plus a large jpeg version of the art, with a white border with their story title beneath it – suitable for framing by one of the many high street photographic shops or online art sites, such as Snapfish.